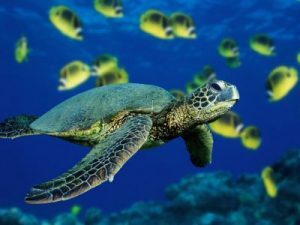 Green Sea Turtle is a Sea Turtle species belonging to the Cheloniidae family and the Chelonia genus. It is found in the tropical as well as the subtropical waters all over the world. This Sea Turtle is a close relative of the Hawksbill Turtle. 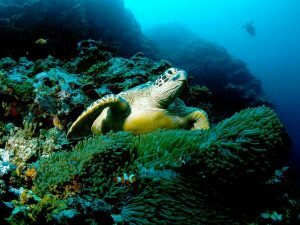 The common names of the species include black (sea) turtle, green turtle and Pacific green turtle. Size: Adults grow around 5 ft (1.5 meters) in length. Weight: Green Sea Turtles weigh between 150 pounds and 420 pounds (68 kg and 190 kg). Turtles of this species occasionally grow 690 lb (315 kg) in weight. 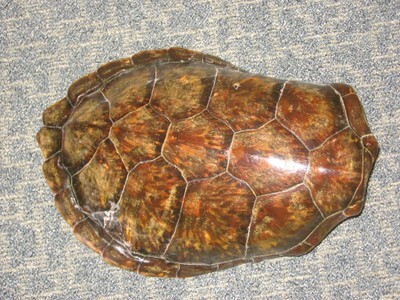 Carapace: Their carapaces are 31 inches to 44 inches (78 cm to 112 cm) long. Five central scutes compose the carapaces. The central scutes are bordered with eight lateral scutes. The area between their plastrons and shells are covered by eight inframarginal scutes. Color: The color patterns of the carapaces change with time. Green Sea Turtle hatchlings have light colored plastrons and nearly black carapaces. The carapaces turn dark olive or brown as they grow up. The matured Turtles have dark brown carapaces marked with rays of different colors, while their plastrons have a yellow hue. Their appendages are dark colored with yellow stripes. Each appendage has a large dark brown patch in its center. Head: They have small beaked heads with short snouts. The beaks are unhooked. These Turtles have two prefrontal scales at the dorsal sides of their heads. Jaws: The edges of the sheath of their upper jaws are denticulated. The lower jaws have relatively stronger and more defined denticulation. Neck: Their short necks help to distinguish them from other similar Turtle species. Body: They have flattened bodies, characteristic of Sea Turtles. Appendages: Mature Turtles have a single claw on each of their appendage. But, young Green Sea Turtles may have a prominent second claw. Their distribution range extends throughout the tropical and subtropical waters worldwide. The 2 major Green Sea Turtle populations are found in the Atlantic oceans and the eastern Pacific oceans. These two populations are genetically distinct having their separate feeding and nesting grounds within their range. They live in three different types of habitats during three different phases of their lives. Adults of this species inhabit shallow coastal waters where they have access to seagrass beds. They are also found in lagoons, shoals and seagrass meadows near the coastal areas. During the reproductive season, they move to beaches to lay eggs. Young Turtles that are less than 10 inches long feed on various aquatic insects, worms, crustaceans, algae and grass. Once they grow above 10 inches long, their food includes algae and sea grass. Adults are herbivorous in nature. These Turtles can dive very deep in the water. But they come to the ocean surface to breathe air every 4 to 5 minutes. Air gives them energy for different underwater activities. 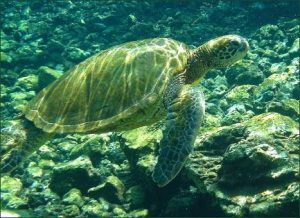 Green Sea Turtles often rest or sleep under the ocean water for many hours. The first 5years of their lives is spent in the pelagic waters of the open oceans in convergence zones. These young turtles usually swim at a speed of 1.6 to 1.9 miles per hour (2.5 to 3 km/hour). Adults like to bask in the sunlight, sitting on the beach. Green Sea Turtles migrate very long distances to find food and to look for suitable nesting sites. The migration takes place during different times for different populations. Sharks are the only predators of the adult Turtles of this species. Especially the Tiger Sharks prey on the Green Sea Turtles in the Hawaiian waters. The hatchlings and juveniles have numerous enemies including different marine mammals, crabs and shorebirds. 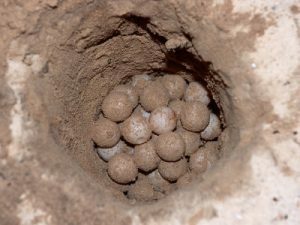 In Turkey, Green Sea Turtle eggs are often preyed upon by Golden Jackals and Red Foxes. The finely serrated jaws of these reptiles are specially adapted for tearing vegetation. They are able to replace the polluted air in their lungs with fresh air in one explosive exhalation and fast inhalation. Their lungs prevent any chances of the gases to be trapped in the lungs by allowing a quick exchange of oxygen. The blood circulation system of these creatures delivers oxygen to the body tissues without any interruption even when the Turtles are diving in deep waters. The mating season varies between different populations. The Caribbean population mates between the months of June and September while the Green Sea Turtles living in the French Guiana nests between the months of March and June. They reproduce throughout the year in the in the tropical waters. Turtles living in the Indian Ocean in Pakistan prefer to nest from July to December. These reptiles are believed to reach sexual maturity between 20 years and 50 years of age. They are known to reproduce every 2 to 4 years. Mating takes place in water. After mating, the females travel above the high tide line of the beach to lay eggs. They use their hind flippers to dig holes in the sand where they deposit their eggs. The clutch size varies depending on the species and the age of the female. Generally, each clutch contains 100 to 200 eggs. The females cover their nests with sand before returning to the seas. The eggs take between 45 and 75 days to hatch. Hatching takes place during night. 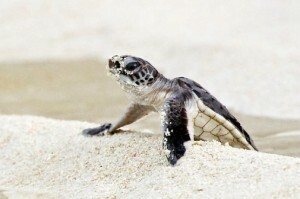 The hatchlings instinctively start walking towards the ocean immediately after they come out of the eggs. This is possibly the most dangerous phase in their lives because various predators including crabs and gulls prey on them as they walk. Due to this reason, a large number of Green Sea Turtle babies never reach the ocean. Not much is known about their initial life after reaching the waters as the first 3 to 5 years are spent in the open seas. Afterwards, the juvenile Green Sea Turtles start living in shallow waters permanently. Only one percent of the total numbers of hatchlings are believed to succeed in overcoming all the threats and reach sexual maturity. Their average lifespan is up to 80 years in the wild. This species is included in the “Endangered” category by the IUCN. The Turtles are protected by law in many countries where they are found. Illegal hunting and egg collecting by humans are the biggest threat to their existence besides the natural threats. Unintentional human threats include pollution, habitat destruction and fishing nets that do not have turtle excluder devices. They are the only living species in the Chelonia genus. This is one of the largest Green Turtle species in existence. The largest known Green Sea Turtle specimen had a carapace length of 60 inches (153 cm) and weighed 870 pounds (395 kg). Much of the known facts about the Sea Turtle ecology have been derived from the studies done on Green Sea Turtle as they were among the first sea turtles to be studied. The females build 6,000-15,000 nests each year on the Ascension Island in South Atlantic. Green Sea Turtles have a very unique food chain as the juveniles are carnivorous and the adults are herbivorous. Here are some images of these gorgeous Sea Turtles.